EZXY®, the plotter for CRTech's Thermal Desktop® and SINDA/FLUINT, allows the user to produce X-Y plots of data contained in either SINDA/FLUINT Compressed Solution Results (CSR) folders, SAVE files, or in databases produced by RadCAD®. Formatted text files may also be used as input files. Charts can be created and saved as individual plot files or as part of a plot set, which is a group of charts which can be refreshed and exported as a group. The information displayed in each chart is controlled by a collection of associated input files. Each plot file may use multiple input files, allowing results to be combined onto a single chart (e.g. to compare different runs, compare test data with predictions. or map heating rates to temperature results). Upon reopening a saved chart, the chart can be updated through the regenerate or refresh commands to reflect any changes that have been made to the associated input files since the chart was last saved. Charts can be exported as graphic files or the data itself can be exported as text files such as comma- or tab-separated files. 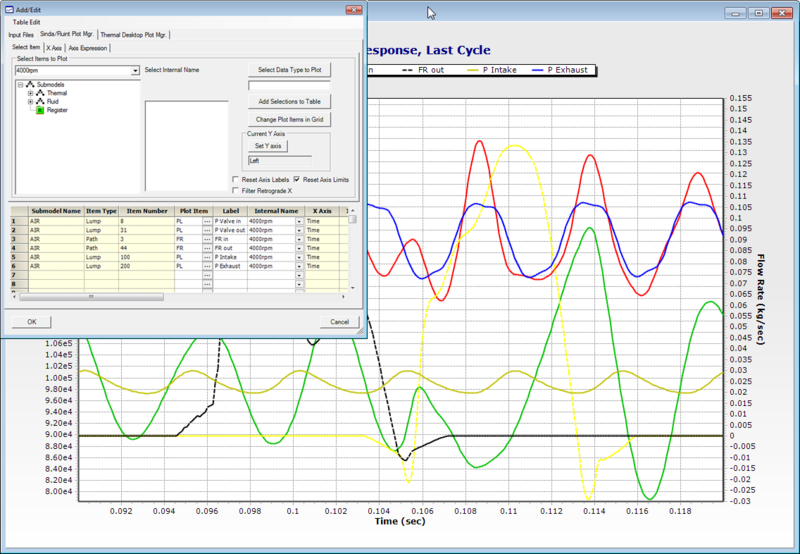 When using plot sets, several plots can be exported simultaneously.